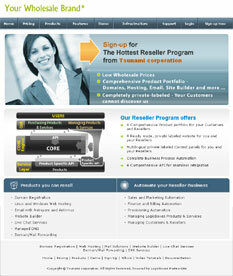 PartnerSite is a complete private-labeled website to jumpstart your wholesale Business. It complements the SuperSite and provides you a turnkey solution for attracting and signing up potential Resellers. Multi-tier - A separate private-labeled copy of the PartnerSite is available to you, your Resellers, their Resellers and so on so that each of you can manage your wholesale business.